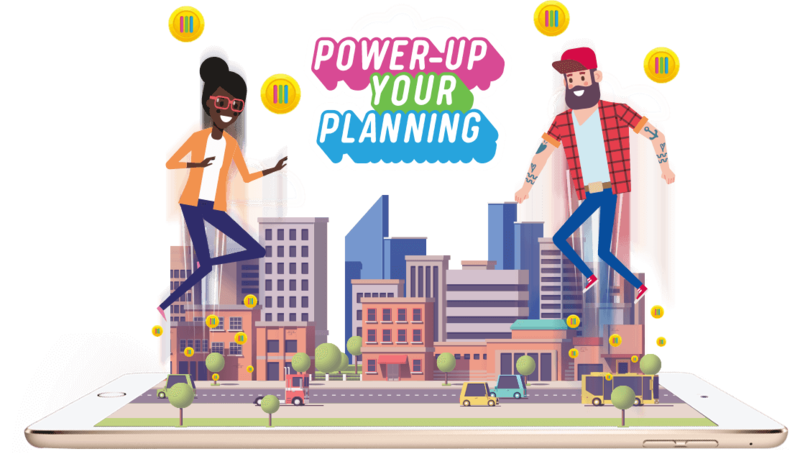 Competition Gamification, HTML5 Producers, Branded Games Creators Power-up Your Planning | Competition, HTML5, Branded Games for Pamco | Koko Digital Power-up Your Planning - Branded HTML5 game developed for Pamco. PamCo, quantitative data handler’s with a company launch on the horizon, wanted to make a big entrance on the published media scene. 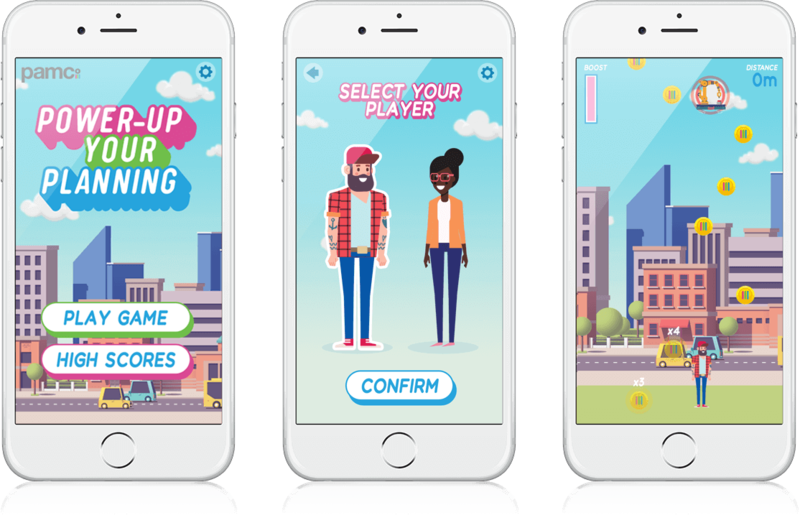 So they came to us to build a fun, branded game for their agency-based clients to enjoy that would coincide with the launch of their new company. The client wanted to create an HTML5, competition based web app that would reward the winner a rooftop office party experience. It was important to incorporate the real life PamCo currency, their measurement of data in the published media industry, into the game. We knew it had to contain sharing functionality to share your score via social media and it was to be a simple userface that kept users clicking! 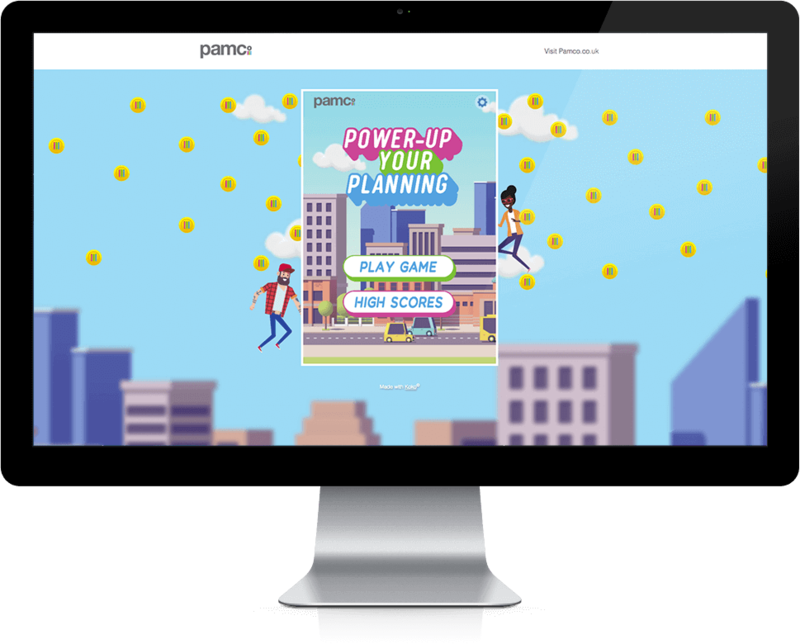 PamCo’s company launch was supported by their Power-Up Your Planning, branded vertical scroller game! Flawless graphics and high end animation made for eye catching visuals. After character select, the user needed to reach as high a distance as possible, collecting PamCo coins and points as they jumped. Users had to avoid ‘online obstacles’ like lost wifi and clickbait that would end their game, whilst trying to win bonus items that activated a super high jump boost to lengthen their game. We were super happy with the finished product and so was the client!